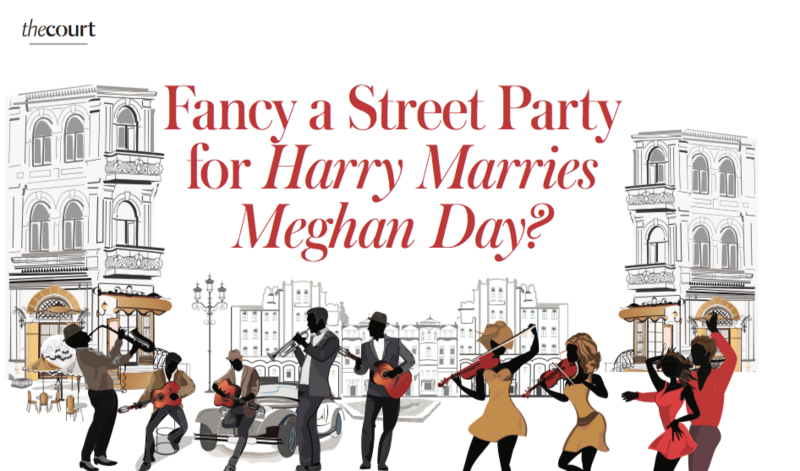 On Saturday 19th May, Meghan Markle and Prince Harry get married and they’re planning a right royal knees up. With the FA Cup Final later that afternoon, many communities across the country are planning on joining in. The classic Street Party is as British as Bake Off and has the same affection for bunting, so here’s The Court’s Guide to holding a street party. Both Hammersmith & Fulham (LBHF) and Kensington & Chelsea (RBKC) councils have waived fees for road closures but you have to apply, fast, through their websites. quiet streets that won’t affect the surrounding roads are classed as small events and, according to the government website, if they don’t require permission for road closures no permission from the Council is needed. parties should seek insurance and RBKC requires an indemnity form to be filled in regarding the management of traffic. This can be found on their website. A license to sell alcohol costs £21 but is not needed if it’s simply being consumed. The same thing for food. Ask everyone to bring something and you’ll quickly have more than enough. Ask around and you should find lost of people who own a portable surface or table. According to the Government website “you don’t need a music licence if you want to play music at your street party”. So get your playlist together, and some banging speakers and go out and make some noise. Bunting is almost obligatory but asking people to come in their best garden fete outfits will also bring colour to the street. Fold Up gazebos make the perfect all weather hangouts and look perfect hung with flags or bunting. And there’s nothing stopping you from putting your picnic blankets out on the pavement. If you’re not surrounded by fresh mown lawns, pretend! And when the night draws in, some disco lights and an extension lead will make your party rock on into the night. Plan some games that will get the wallflowers and the more shy neighbours involved: tug’o’war, space hopper races, wellie throwing, treasure hunting and so on. Dancing and a little football (try not to dent the cars) will get you ready for the FA Cup when a few guests may disappear inside. a hangover. Part of the RBKC indemnity is an agreement to clear up after you. Sunday morning, put your marigolds on, get your blackbags out and start tidying up. AND if you can’t be bothered with all that, Chelsea in Bloom is organising street parties in the area to mark the day. No venues con rmed at time of press.